MANILA, Philippines – The October 2018 & November 2018 Psychometrician board exam results including the list of passers, top 10 examinees, top performing schools, performance of schools and related announcements are available at this website as PRC officially releases the results three (3) working days after the board examinations. The October 2018 Board Licensure Exam for Psychometricians were administered by PRC Board of Psychology headed by its Chairman, Ms. Miriam P. Cue and its members, Ms. Alexa P. Abrenica and Ms. Imelda Virginia G. Villar on October 29, 2018 and November 13, 2018 at PRC testing centers in Baguio. As announced, 550 out of 1,010 examinees passed the exams. The scheduled exams in Baguio scheduled on October 30, 2018 was postponed and later re-scheduled on November 13, 2018 due to the onslaught Typhoon "Rosita". In the most recent exams conducted on October 2018 at other testing locations, 4,035 out of 8,453 examinees passed. 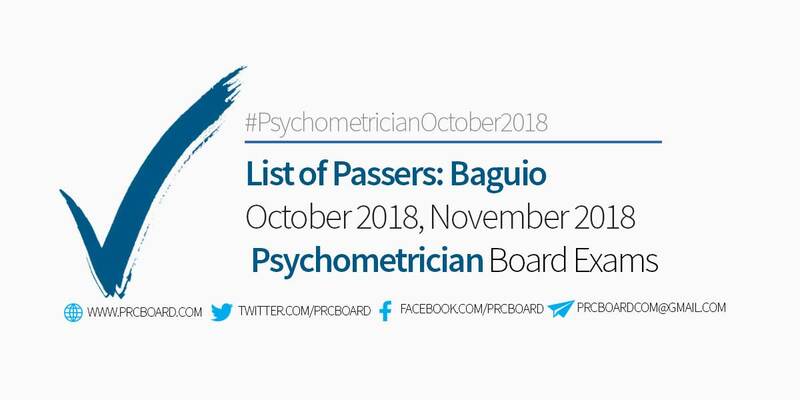 Here is the full list of passers in the October 2018 & November 2018 Psychometrician in Baguio, courtesy of PRC. The October 2018 and November 2018 Psychometrician board exam results are expected to be released in 1-3 working days after the exams or by November 14-16, 2018. During October 2017 Psychometrician board exams, results were released after four (4) working days. The Psychometrician board exams covered the following topics. To receive up-to-date news about October 2018, November 2018 Psychometrician board exam (Baguio) results, we advise our visitors to bookmark this page, visit PRC official website or follow us at our social media pages via Facebook and Twitter.